Bauhaus tubular chromed steel and ebonized beech armchair by Dutch designer Mart Stam for Thonet, 1932. The original wood finish has worn patches and there is some rust and losses in the chrome, all visible in the photos. Measures: Arm height 27.25". 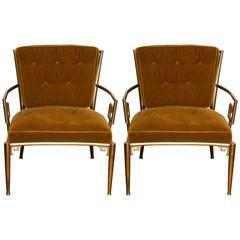 A pair of fine brass Maison Jansen-style armchairs with armrests in the shape of Greek keys. Cushions are upholstered in caramel cotton velvet with a tufted back. 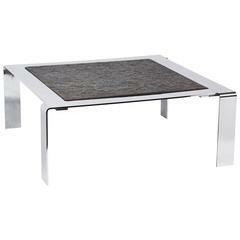 1960s French coffee table in chromed steel with slate top. Substantial. 1970s smoked glass and chrome table lamp by Frank Ligtelijn for RAAK. Recently rewired and in perfect working order. Wired for USA. - 1930s, Czechoslovakia - Designer: Mart Stam - Maker: Robert Slezák - Both signed - Original yellow color - Chrome in perfect condition - Published in catalogue.